HINT: If you need more time to read the image caption, hover your mouse cursor over the image to pause the slideshow. These two spiral galaxies, collectively known as Arp 87, are interacting gravitationally as they pass by each other. The "Crab Nebula" is also known as "M1" - the first object in Charles Messier's catalog of deep sky objects that he discovered while searching for comets. The nebula is the expanding remains of a supernova, whose light first reached Earth in the year 1054 and was recorded by Chinese astronomers. NGC 602 is a star forming region located in a satellite galaxy of the Milky Way known as the Small Magellenic Cloud. Intense ultraviolet radiation from the massive, hot, young stars in the lower portion of the image is hollowing out a cavity in the cloud of gas and dust from which they formed. The stronger gravity of NGC 2207 (the larger of the two on the left) is visibly disrupting the spiral structure of its neighbor (NGC 2163) in this near collision of two spiral galaxies. Perhaps the most visually striking of the planets in our Solar System, Saturn displays its southern hemisphere and the "underside" of its majestic ring system in this Hubble Space Telescope image. Look closely near the center of this "star-spangled" wide-field HST image and you will see the expanding rings of a supernova explosion. In February of 1987, astronomers in the southern hemisphere witnessed the brilliant explosion of this massive star. Located in a satellite galaxy of the Milky Way known as the Large Magellenic Cloud, the supernova actually took place some 160,000 years ago. It has taken that long for light and other radiation from the explosion to travel to Earth. Seen nearly edge-on in this beautiful HST image, the massive spiral galaxy known as the "Sombrero" (due to its shape), displays its uncommonly large, bulbous halo of stars and its thick, dark dusty rim. This massive galaxy is perhaps three to four times as large as our own Milky Way galaxy. Menzel 3, The "Ant Nebula"
The unusual shape of Menzel 3, gives this planetary nebula its appropriate nickname. The nebula is the expanding remains of a smaller-sized star that is nearing the end of its life. While astronomers have theories about the cause of its appearance, the actual mechanism that is responsible for the odd, symmetrical structure of the nebula has not been determined. The Big Sky Astronomy Club is a group of dedicated amateur astronomers located in the beautiful Flathead Valley of Northwestern Montana. a poignant and special message from the late Dr. Carl Sagan. "Discover the Universe with The Big Sky Astronomy Club"
It is with great sadness that we announce the passing of yet another of the club's most beloved members. Ken Hair passed away June 13 of natural causes at his home in Kalispell. Ken had been an active member for over 15 years. His enthusiasm and love of Astronomy was all too evident to everyone in the club. Ken was inevitably the first to show up at every club meeting, star party or other public outreach event that the club held. As it was with his fellow club member Al Ebeltoft, whom we lost last December, the members of the Big Sky Astronomy Club will also miss Ken's smile, his keen sense of humor, his support of the club and his love of the night sky, each of which he selflessly and enthusiastically shared whenever we were with him. It is with great sadness that we announce the passing of one of the club's most beloved members. Al Ebeltoft passed on December 31st of natural causes at his home in Kalispell. Al was one of the original, founding members of the Big Sky Astronomy Club in 2000. He was a very active member, enthusiastically offering his time, talents and knowledge to the club's public outreach efforts. Al was also an avid astrophotographer who spent many hours in his personal observatory. The members of the Big Sky Astronomy Club will miss his warmth, his support and his love of the night sky, each of which he selflessly and enthusiastically shared whenever we were with him. 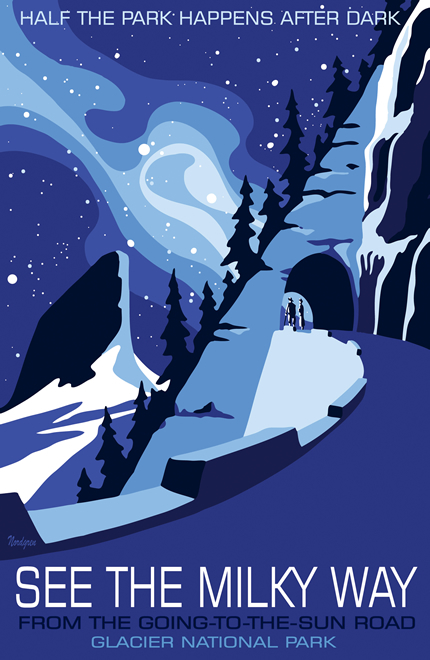 The Big Sky Astronomy Club will once again work with the management of Glacier National Park to put on a very popular Summer Stargazing Program at the Apgar Transit Center on the west side of the park and at St. Mary on the east side. 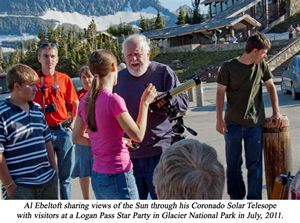 Over the past six summers, literally thousands of visitors from all over the world have had a chance to view sunspots on the face of our Sun during daylight hours and then, each evening, they have had an opportunity to view many of the interesting deep sky objects visible through telescopes of various types and sizes under the truly dark skies found in Glacier. For the 2019 season, the Astronomy Program will likely begin during the second week of July. Check back later this spring for the actual starting date. On the west side, it will run Sunday through Wednesday each week. The east-side program will run Wednesday through Saturday each week. Solar observing will be available from 12 Noon to 2 PM and the nighttime observing session will run from 10 PM until Midnight. If you'd like more information on this program, please contact Park Headquartes at 406-888-7800 or visit our "Contact Us" page and send us a message. And, please let us know that you saw this message on our website when you come visit us at Glacier. 2019 Lone Pine Astronomy Prog. 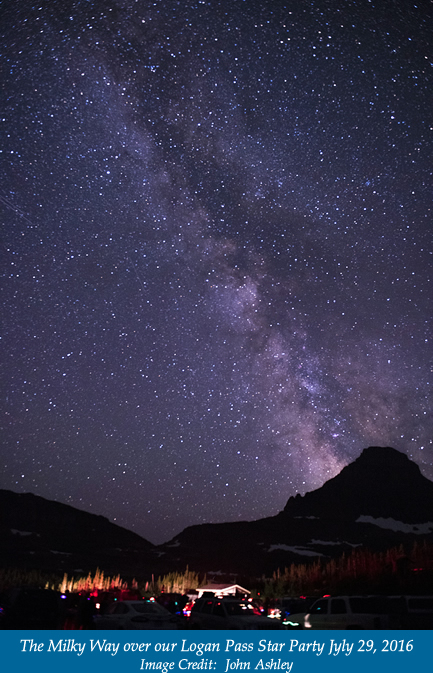 The Big Sky Astronomy Club, in conjunction with Glacier National Park, will once again host three star parties this summer under extremely dark skies at the Logan Pass Visitors' Center parking lot at the summit of Going-To-The-Sun-Road. The events are extremely popular, with attendance at each event approaching four to five hundred visitors. The 2019 dates for these fun events have not yet been established, so check back often. The dates will also listed on our Meetings and Events Calendar. The events will be held on Fridays, with the following day (Saturday) reserved as a backup in case of inclement weather on the primary date. Tickets for each event will be available through Glacier National Park. 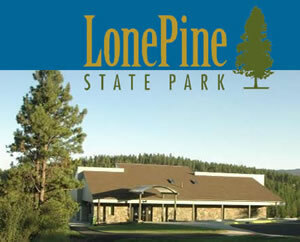 Contact Park Headquarters (406-888-7800) for more information. The Big Sky Astronomy Club will host our eighth annual state-wide star party, Montana Starwatch this summer on private property near Twin Bridges, Montana. The property is owned by BSAC club member Joe Witherspoon. This will be the eighth year that the star party has been held at this wonderful, dark sky site. We are planning two great presentations on the Friday and Saturday nights of the star party. For more information, including a registration form for the event, please see the official Montana Starwatch website at: montanastarwatch.org. 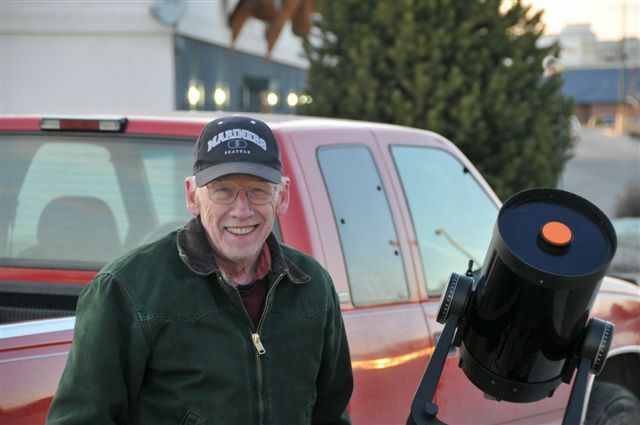 Big Sky Astronomy Club member Joe Witherspoon and his personal observatory located outside of Twin Bridges, Montana, were featured in a very nice article published in the Missoulian newspaper on Thursday, November 14th, 2013. The in-depth article described Joe's interest in astronomy, his personal observatory and what prompted his eventual move to Twin Bridges, having lived in the light pollution of Tacoma, Washington for many years. The article can be read online at the Missoulian's website by clicking here. The Big Sky Astronomy Club was featured in a very nice article published in Kalispell's Daily InterLake newspaper on Wednesday, September 4th, 2013. The article described our history, our many outreach efforts along with our plans to build an observatory/education center and purchase a portable planetarium for use in our educational outreach. The article can be read online at the Daily Inter Lake's website by clicking here. © Copyright 2012, The Big Sky Astronomy Club, Inc.